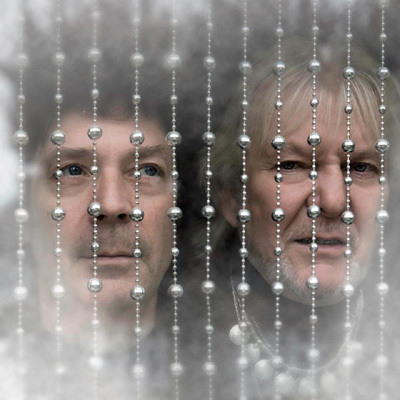 Its been a 12 year musical roller coaster for YES founder Chris Squire. Back in the year 2000, still in the YES heyday, Chris was also keeping busy with Billy Sherwood and their group, The Conspiracy. In 2005, Chris took his pre-YES band The Syn around the block for a couple of releases. 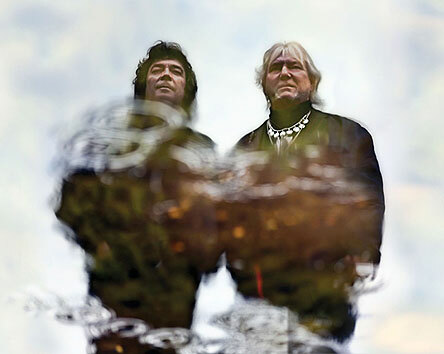 After Syn, YES nearly imploded in 2008 with the leaving of Jon Anderson, then came the Fly From Here album with a multipart title structured around a 1980 idea by producer Trevor Horn. 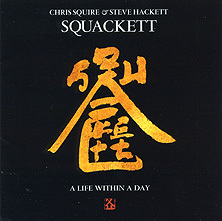 When you think about his early 2009 Swiss Choir CD being a kind of a post-Syn conversion, its more than satisfying to find Chris in primo form on record in the company of progressive rock guitar hero Steve Hackett on A Life Within A Day featuring the first ever album from their new project Squackett. Hackettwho has consistently released critically acclaimed solo albums over the past four decadestastefully seasons the Squackett sound with rare musical insight and sonic muscle similar in vibe and vision to the original King Crimson lineupit's just that good and mind-blowing. Combining Beatles inspired pop with virtuoso prog-fusion musicianship, the 9 track Squackett CD combines the best of Squires YES influences and Hacketts multifaceted guitar careersolo and with Genesis. The album starts ominously enough with the hard rocking, goth-prog title track followed by the neo-metal Tall Ships, but by the time Squires backing vocals kick in mid way through the track you know youre in for a real treat of an album. Superbly produced by Hacketts keyboard expert Roger King, this first Squackett CD also showcases solid drumming from Jeremy Stacey, while enhancing Chris and Steves multi-tracked harmonies are additional backing vocals supplied by Amanda Lehmann. Some tracks here like Aliens, The Summer Backwards and Divided Self are each ground breaking modern rock tracks in their own right. 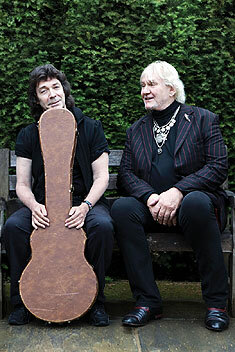 Squires one time YES showpiece Aliens, while tentatively performed by YES upon the song's debut in late 2008, is finally given a perfectly well scripted vision on the Squackett CD. Very hard rock and metallic one moment and then all Beatle-esque wall of harmonies the next, theres no stopping Squackett from becoming a vital force in the still unfolding history of 21st century progressive rock. SH: Hello Robert, howre you doing? mwe3: Where are you now? mwe3: How much time do you have to talk? SH: Im okay for time. How long do you need? mwe3: Im not sure, I have a lot of questions. mwe3: I saw that ad for your show in the April 2012 issue of Prog magazine for the May 20th show at Islington Assembly Hall in London in aid of Childline Rocks, it was described as a celebration of your career? SH: Thats right yeah. That was a good show. It was in aid of a charity over here called Childline. Yeah, that was a sellout show and it all went very well. Much supported by the media. Its for disadvantaged kids. Kids that are in distress can call this line, for what ever reason it might be. And they have volunteers manning the phones for that. 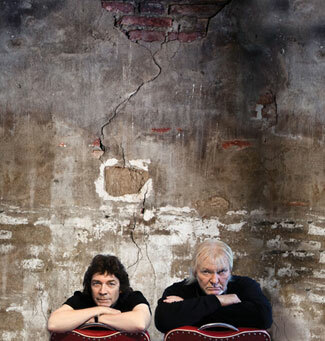 mwe3: I remember seeing YES on November 22nd, 2008 with Benoit David singing and YES actually played Aliens. It sounded quite strange to me, like a demo but I never forgot it. mwe3: What a great relief to hear it the way you guys have recorded it on the first Squackett album A Life Within A Day. Is that kind of where Squackett starts because I read that you hadnt recorded with Chris before right? SH: Well, actually...no. The story is Chris was doing a Christmas album in 2007 and I played on that. And then he played on a couple of solo things of mine but we took various things off it in order to do this combined project together, including Aliens which theyd done in sketch form, live. Theyd just done a kind of acoustic version of it. But we gave it the kind of full band treatment really. mwe3: So Aliens is kind of a co-write? SH: No. That track originally is something that was written by Chris, but obviously I contributed to the arrangement that you hear on the record. And many things were written face to face but somethings were already written and in some cases, some were already recorded. But, you know, as soon as someone starts contributing their part to something, they become part of the writing process. At least thats the way we used to do it in Genesis, in the early 70s. mwe3: How long did it take to finish A Life Within A Day and where was the album recorded? SH: Well, we spent a long time doing this record because there were other things going on at the same time. Originally, Chris was living over here in England but then he moved back to the States. So the album took about four years, from the start of recording to finally getting the thing released, which will be happening in a matter of days. mwe3: I read you said you were aided by the help of some vitamins and tea. (laughter) What kind of vitamins and tea were you taking? SH: Oh, the vitamins. Well in my case it was probably just vitamins. In Chriss case, I dont know. But we were pretty straight for most of the album. Im not really one for the poisons myself. I lead a pretty straight life to be honest. I think tea is a very healthy option compared to a lot of things you can put in your body. I prefer to be straight these days to do things. You know what Im saying? I dont like to embrace the many colored beast. I dont like to do the poisons. Its always worried me. I never thought it was a career move myself. I know thousands might disagree with me and there a many bands that are constructed with the idea of teetering on the brink but I dont see why it has to be a dance of death. Im into the longevity game. As long as I can be around, making as much music as I possibly can, I get a lot of joy from that. And of course, love is the drug as they say. So, the love of a good woman is, in my case, my wife Jo provides that inspiration and also input on lots of the things that I write. So, all is good. mwe3: I do agree with you on the other stuff but I do favor of some form of medical cannabis for those who cant tolerate the old demon alcohol. SH: Well, I mean... Ive been no saint in my time but I would say that the best thing you can do is to stay as straight as you can. For most of my teens, of course, that wasnt the case. In England here, what we tended to do, from the age of God knows what, we were drinking beer every night and that was how it was. But then you learn to sober up. You realize that if youre playing a certain kind of music, that's more demanding than blues, you have to be on the ball for it. So I found very quickly that that wasnt an option. When I was working with Genesis I needed to be on top of my game. mwe3: Its strange how the early progressive rock scene from the late '60s and early '70s sort of egged on the drug culture. But I know I what you mean. Like the song Turn Turn Turn... a time for everything. SH: Yeah... As I say, I had friends who showed me that the way their lives had turned out, that the difficulty was a lot of them got into desperate straights with that kind of stuff, so I always thought, No, I dont want to do that. Its easy to squander your health. So I always think you need to be careful about that stuff. And I get high on music. I get high on natural highs so to speak. mwe3: Just to change the subject, we could talk about psychedelia till were ninety years old but I was pretty impressed with the Squackket record coming out on the Esoteric Antenna label. Is that a new label created for this album? SH: Well its a label thats run by a company called Cherry Red in England. And Esoteric, in this case Esoteric Antenna is a label within it run by a guy called Mark Powell. He and I have known each other for quite some time. In fact, were neighbors here in London. He was the one who really came up with the deal for the Squackett album. mwe3: Is Squackett a return to the supergroup concept and are there other potential supergroup albums possible that may be inspired by Squackett? SH: Yeah, its entirely possible. But as I say, I knew Mark. Hed already done some sleeve notes for albums of mine and we were talking about doing some stuff together for quite some time. And with regards to Squackett, whether it fits the bill of a supergroup or not, so far its a recording project. One that I think sounds very good. mwe3: Im predicting Squackett will be in the top ten best albums of the year yknow? SH: Well thats good! Im pleased that you feel that. Theres a lot of stuff on it...but, I think its probably a little simpler than some of the stuff Ive done over recent years but maybe I needed to do that. I needed to simplify and do stuff that was more straight ahead. And I think for Chris too. I mean it doesnt have to be complicated to be appealing. I think it can have a very direct message. I wouldnt say there was anything on the album that cant be taken at...ahh...in the way its intended to be. I was going to say at face value but that would be crediting Phil Collins. You can take it at face value. Theres not too much thats complex there. I mean, there might be the odd romantic lyric of course. And I think lyrically its rather good. Sometimes romantic, sometimes slightly dry humor, English humor, ironic stuff... Have you got hold of a copy of the album yet or are you working from a download? You probably dont have too much information about it at this stage. mwe3: I have a CDR and the lyrics. The incredibly powerful rock sound is the first thing that grabs you and of course hearing you and Chris, its everything that a prog-rock fan could want. SH: I hope so. I hope that is the case. I hope it lives up to expectations. People might be expecting something a little more complicated from the two of us but you know we wanted to write some accessible songs and its not the first time Ive worked with a member of YES of course. I had GTR with Steve Howe in the mid 80s. This time, I think the thing that we did was less corporately authorable. It was a self-funded project so it meant that we got the record right before it went to any record company. There was no one...lets just say the notes were not accountable to anyone other than ourselves for the duration of the recording, which was over a slow period in order to make it as strong as possible. We wanted to do as much as possible together, shoulder to shoulder, so I had to catch Chris when he was back over here, between moving house which is why it took a lot longer than originally intended, but sometimes these things do. mwe3: Speaking of YES, what do you think about whats going on the YES these days? I never saw so much sensationalism surrounding YES, what with Jon Andersons illness, and then Benoit coming in and now a new singer? SH: Well, all sorts of stuff. I always enjoyed Jons vocals. I think that he was an extraordinary singer and is an extraordinary singer. I thought Benoit was very good with the band but I havent heard the new lineup yet. So, I imagine its very good. You know, theyve had a very flexible turnover of artists for a very long time. Theres always been several teams of people making up YES, several reserve teams I think. Its been absolutely brilliant. I really enjoyed the Relayer period. And I enjoyed 90125. I enjoyed The Yes Album, Fragile, Close To The Edge. All of those albums. Id even worked with Pete Banks in the very early days on a solo album of his, so... I guess we go back a long way. Ive worked with Rick Wakeman live on TV. Theres been quite a few people in that band Ive done stuff with so it seems a bit of a natural for me really, doesnt it? Im almost a kind of honorary member of that band, at a distance. mwe3: Speaking of the supergroup phenomenon, Roger King did a spectacular job producing and playing keyboards on the Squackett CD. What did Roger bring to the Squackett album? SH: Yeah, he played keyboards on the album and he wrote the stuff with Chris and I and he produced it. So, he basically coordinated the project in the sense of the word. He was working on the goods whilst I was having to do other things. And so, in a way, it was a way of getting the album finishedthe idea of giving him the power to do that and be certain that he has a vested interest in doing it as a bonafide producer of the thing. So much of the detail that you hearthe keyboard detail and the production sounds, many of them are courtesy of Roger. And you can hear those to great effect if you hear the 5.1 mix of this which is...which I think is spectacular basically. Thats how I see it. mwe3: Was the 5.1 mix of the Squackett CD a separate thing? SH: Yeah, its a separate version. Theres another version of the album which...its a package which has both the stereo version and the 5.1 mix. Its a DVD format in order to get the 5.1, yeah. mwe3: The music world has come a long way since 1986. I remember my first CD player from 1985a Mission player from England which cost me eight hundred dollars and you had to wait weeks to get it because of the huge back orders. Where do you think the music world is going? Its really strange, some artists dont even want to press CD anymore, much to my dismay. Its a real shame...a real bummer. SH: Well...I think the work Ive been involved with in recent years...I would say it was all part of the fight back of audio. In Europe right now, the music that was once described as progressiveor with hindsight is being called progressivethat music seems to be more popular than ever. I think theres music presswhich is there to support it. Certainly theres been radio there to support it. So, although its a kind of contracting marketplace, with CDs selling less, Ive been finding that that is the opposite with me, that things have been selling more. I think if you make a quality product, people can tell that youre really committed to it. I seem to be working with a number of peopleall of whom seem to work on to save the system. And so we should open each others things and it makes for very interesting projects I think. Its a very interesting time. Theres a lot of camaraderie in the business. A sense of fellowship and brotherhood if you like of people who are doing very good stuff, who obviously really care about every note, people that are passionate about music, people who are happy to write songs that are equally happy to play their instruments. So we are back to a time of idealism. Its a kind of cottage industry right now. A lot of people are working from home. Many of the people I work with at the moment, with various projects, are starting to work from home. And much of this stuff was done in the living room at home. It wasnt all done in the studio. Technology affords that these days of course. Your studio is really the size of your computer screen and your imagination. Youre not dependent anymore on volume. You dont have to be. Thats the way it was in the past. You can do it in the age old way but, in the world of the virtual imagination, the sky really is the limit. SH: Part of it was. Not the drums, not the bass in the main but much of the rest of it. mwe3: Because, I thought the mastering of the CD was brilliant. It really captures all the dynamics. What part does mastering play in your albums and who did the mastering for the new Squackett album? SH: Well, that was Roger as well. Roger mastered it. Its an interesting thing isnt it? People have been questioning the whole phenomenon of what is mastering. And because the plug-ins exist with the ability to be able to master your product. To take something that begs to be finished and then to be able to use multi-band compression and various plug-ins to enhance it. And you can really change something drastically once its been finished. I remember years ago, working with Eno, when we did The Lamb Lies Down On Broadway, with Genesis. Eno came in one day, Brian Eno, and he was saying the very same thingtheres a lot you can do to an apparently finished product. And of course, since then, theres a tremendous amount of things you can do because compression came into its own. Its almost as if you virtually have got the ability to mix or remix at the mastering stage if thats what youre after doing. And I find the mastering stage is really desperately important, I find, for getting things bright enough, and full enough. And the bass area of things is the most difficult I find. Not to have it too soggy at the bass end of things but then I dont like to have things too brittle and too bright so that theyre unlistenable on headphones, so we try and make it user friendly, I should say, on all formats to get a truly portable mix that youll be able to listen to on small speakers, large speakers... And you know many peoples stereos sound great with classical music but theyve got all that low end that you dont really want. A lot of people who have loud systems at home have excess low frequencies that are really not that controllable and yet this album sounds very good being played back on very user unfriendly systems. But because we took that into account, we wanted to make sure that it would survive that...it would survive the boom factor. So its been cleaned up considerably from the original mix if you see what I mean. mwe3: Ive actually heard albums that were mastered twenty years ago that sound better then some albums that were recently remastered. I dont want to implicate any labels that really screw up the remastering of some classic albums. SH: Sure, well its easy to do that. Its easy to make the mastering too bright. In the 1980s everyone fell in love with the idea of brightness so everything was sounding really tinnyfrom the hi-hat to the Fender Rhodes sounds that everyone was having on every ballad. And unfortunately, it creates bulletproof sound and you lose a lot of the warmth that I think was there with some of the 60s things in fact. So, you dont always have to have enormous drums. Sometimes dry drums can sound very good as well. It doesnt always have to sound like a stadium as far as Im concerned. MWE3: Jeremy Stacey played drums on the Squackett CD. Jeremy also played on the SYN album... How did Jeremy get involved in the Squackett CD and what did he bring to the sound? Also do you know Jeremys brother Paul Stacey and did you hear the SYN album Paul produced back in 2005? What do you remember about Andrew Jackman who was in the SYN with Chris and Steve Nardelli? SH: Jeremy played on Chris Christmas album and I thought he was a great drummer. Both Chris and I were keen for him to play on our project. He has a powerful and innovative sound. Yes I know Paul too. Hes also really talented. No I havent heard the SYN album yet. I liked Andrews work on Fish Out Of Water. I believe Chris misses him greatly. MWE3: You also worked with Jeremy Stacey and Gerard Johnson on Chriss Swiss Choir album? What was working on that album like, which tracks did you like and how did you become involved with Chris during the Swiss Choir album sessions. Also can you compare working with Gerard and Roger King as keyboardists and producers? I saw Gerard actually co-wrote some of the Squackett tracks? SH: Yes I worked with them on the Swiss Choir album. I liked it all. Chris contacted me. I did my part for the album in a busy two weeks. Gerards work was at a distance whereas Roger and I work face to face. They are both very talented. They studied together. Yes I believe Gerard was involved with the last two tracks. MWE3: Can you compare your performance of the guitar and overall concentration levels while making vocal based albums with instrumental albums? SH: On some of my instrumental music the guitar is the voice. With vocal material the guitar often supports the voice, although it takes off in its own right in the solos. MWE3: What electric guitars are you featuring on the new Squackett CD? What classical guitars are you using these days and did you use classical guitars on the Squackett album at all? How about strings you use on your electric's and nylon string classical guitars? SH: Electric guitars featured are Fernandes and Coral Sitar. I use Yairi acoustic guitars. On electric its Fender 008s and on acoustic Pro-Arte light tension strings. MWE3: Do you ever compare notes on guitars with other players? Hows your relationship with Steve Howe these days and did you hear his Time album made with Paul K. Joyce? SH: Yes. Steve Rothery for instance. Its genial between myself and Steve Howe. Its nice to see him around. No I havent yet heard his Time album. MWE3: Someone described Squackett as Genesis merging with YES. Do you often get asked about any possible collaborations with other Genesis members? Do you keep in touch with your former Genesis band mates and whats your favorite Genesis album? SH: Yes I do get asked about collaborations, usually by fans. I have worked with Anthony Phillips in recent years on Out Of The Tunnels Mouth. I sometimes see the other Genesis guys and its good to cheer them on. My fave Genesis album is Selling England. MWE3: Some YES fans were upset about Jon Anderson being removed from the band. Shouldnt YES at least let Jon play on some studio tracks or do you think that will never happen? SH: I guess its up to them! I dont know the details. MWE3: Why do you think YES havent been inducted in the Rock Hall of Fame? I know its kind of show biz thing but the Moody Blues also have not been put in. Do you know Mike Pinder, the mellotron master, who founded the Moody Blues back in 1965? Mikes family, including his sons, The Pinder Brothers band have made some excellent tracks. And do you still use the Tron? SH: Ive gone on record publicly to suggest YES should be inducted. I liked Mike Pinders work but dont know him personally. Id be happy to listen to the brothers music, thanks. I use samples of the Tron and still love it. MWE3: I know we spoke about the Esoteric Antenna label in England and MVD is releasing Squackett here. How about future releases in Japan, and beyond? SH: It is being released in Japan as well. MWE3: How is Inside Out Records doing? Seems like they dropped their presence here in the US. Is it the same company and what are they doing these days? Are you exclusively sign to Inside Out and how about your label Wolf Work? SH: Inside Out Records is doing fine and will be the company for my next project. They distribute via Century Media / EMI. Yes I am signed to Inside Out. Wolf Work distributes via larger companies. MWE3: Can you say something about these Squackket tracks? Divided Self. That sounds like the perfect mix of YES and Genesis. SH: Its a parody of the sixties with paranoid lyrics. An homage to the past. MWE3: The Summer Backwards. Chris and you added some amazing harmonies. How many layers of vocals were used, who wrote the lyrics and who else sings on that track? SH: I lost count, hundreds of layers probably! I wrote the lyrics with input from my wife Jo. Its just myself and Chris singing. MWE3: Stormchaser. That song sounds like an exorcism or an actual hurricane, which is kind of the same thing! Is there a theremin break in there? SH: A song to appease the weather gods... The synth line does sound like a theremin, yes. MWE3: Aliens. What did you think that song was hinting at? How many guitars on that track and any mellotron? SH: Its a Chris sci-fi idea of people going back in time and being mistaken for aliens. Yes we both sing on the chorus and other parts too. Electric and twelve string guitars are on it. Mel samples. Chris wrote the lyrics. MWE3: Perfect Love Song. A great Chris vocal and a great song to end an album with. SH: The vocals are both Chris, myself and Amanda Lehmann. The chorus is Chris lyrics and the rest are mine. An homage to the resolving power of love and music. MWE3: Beyond The Shrouded Horizon was a brilliant album. The tracks on that album with Chris are amazing including on the first track of the Four Winds suite on the bonus CD. What inspired the four part Four Winds and also my favorite track from the Shrouded Horizon CD Between The Sunset And The Coconut Palms. SH: The Four Winds idea was inspired by four scary busts of the Four Winds I saw in my childhood at Battersea Funfair in London. I thought the idea suited those four contrasting pieces. Between The Sunset And The Coconut Palms was inspired partly by a book Jo has written about rebels and a sense of how refugees must feel and the magic of adventuring into unknown waters. The title was taken from a line in a Peter Sellers sketch. MWE3: Also the Jan Akkerman / Focus cover of Eruption: Tommy was great from Beyond The Shrouded Horizon CD. Any history on that track and why did you choose it? SH: It was a favourite of Phil Collins and myself. I met Jan a few times in the early days and I really liked Moving Waves. MWE3: From what I hear progressive rock as we know it is even more popular in South America, in fact its huge world wide. How do you keep a big planet happy musically and what do you see as the future of prog-rock music? SH: By touring as much as possible and being open to the influence of the world stage. I see prog rock music as becoming part of the classical music of the future. E3: Ian Anderson almost snapped at me when I asked him about astrology. Are you into astrology? Do you have other hobbies or fascinating diversions you could mention? SH: Im not particularly, but its interesting to hear the character portraits and archetypes that come from it. I like to read, walk and explore historical sites and haunted places! MWE3: Do you follow politics? Can you compare the US and the UK government wise and is there any hope for the future considering the political nonsense and the endless wars? SH: We have a right wing government right now which is failing Britain. We need to be able to create investment opportunities and give more care to those who need it. I think processing bills is slower in the US but its good that the individual states have their voice. I hope things will improve. As I said in Israel, peace doesnt have to be a distant dream. It starts in all our hearts. MWE3: How about soundtracks? I remember you told me you did a soundtrack called Outwitting Hitler. Did that ever come out? What are your favorite film / movie / TV soundtracks? The 60s soundtracks from the U.K. like The Thunderbirds are amazing. SH: Outwitting Hitler was shown on HBO. I dont think a DVD of it was released. I love Nuevo Cinema Paradiso and its soundtrack. I also really like Gladiator. Ben Hur has a fantastic score, as has Gone With The Wind. I liked the music to a TV programme called The Owl Service. MWE3: I remember we were talking about Hank Marvin and The Shadows back in 2002 and you told me the first electric guitar record you bought was Man Of Mystery. Any other memories of The Shadows and other favorite Shadows songs and what impact do you think Hank had on you and other budding guitarists 50 years ago? SH: I bought all the Shadows records back then. I particularly liked Wonderful Land, The Shadows plus orchestra. Hank was my first inspiration for electric guitar, and a very nice, modest man. MWE3: How about that rarities album you were talking about ten years ago? 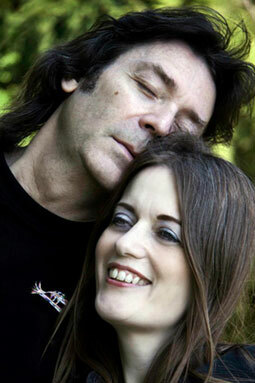 What kind of tracks would you consider for a possible Steve Hackett rarities album? I remember you told me about that track you did for Miles Copelands instrumental based No Speak label called A Life In Movies. SH: I think Ive been including rarities on albums since that time, as additions to the main tracks. I believe I played all the instruments on A Life In Movies myself. MWE3: What are you planning next for Squackett and beyond? Any chance for a few dates in the US with Squackett and or a possible DVD?